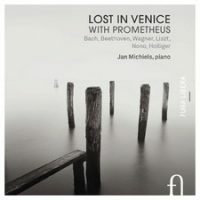 “Lost in Venice with Prometheus.” Franz LISZT: Excerpts from Von der Wiege bis zum Grabe (1882; arr. LISZT); R.W. – Venezia (1883); Am Grabe Richard Wagners (1883); La Lugubre Gondola I and II (1882); Unstern! Sinistre, disastro (1881); Two Csárdás (1884); Nuages gris (1881). Richard WAGNER: Prelude from Tristan und Isolde (1859; arr. Zoltán KOCSIS); Isoldens Liebestod from Tristan und Isolde (1859; arr. LISZT, 1868); Feierlicher Marsch from Parsifal (1882; arr. LISZT, 1882). Ludwig van BEETHOVEN: Die Geschöpfe des Prometheus, Op. 43 (1801). Luigi NONO: …sofferte onde serene… (1976). J.S. BACH: Sinfonias Nos. 9 and 15 (1723? ); Prelude and Fugues Nos. 11 and 23 from WTC II (1742?). Heinz HOLLIGER: Partita (1999). Jan Michiels (pno). Fuga Libera FUG716 (3 CDs) (http://www.outhere-music.com/). “Liszt Inspections.” Franz LISZT: Ungarisches Volkslied Nr. 5, S. 245 (1873); Fünf Klavierstücke: II. Lento assai, S. 192 (1865-79); Bagatelle sans tonalité, S. 216a (1885); Historische Ungarische Bildnisse: Michael Mosonyi, S. 205 (1885); Harmonies poétiques et religieuses: Funérailles, S. 173 (1849); Anneés de Pèlerinage II: Italie: Il Penseroso, S. 161(1838-49; rev. 1858); Anneés de Pèlerinage I: Suisse: Au lac de Wallenstadt, S. 160 (1848-54); Wiegenlied, S. 198 (1881); En rêve: Nocturne, S. 207 (1885); Weihnachtsbaum: Cloches du Soir and O heilige Nacht, S. 186 (1875-76); In festo transfigurationis Domini nostri Jesu Christi (1880); Resignazione, S. 187a (1877). Friedrich CERHA: Slowakische Erinnerungen aus der Kindheit Nr. 20 (1956, 1989). György KURTÁG: …waiting for Susan… (1992; rev. 1993). György LIGETI: Études Book I: Touches Bloquées (1985); Études Book II: En suspens (1988-94). Gérard PESSON: Vexierbilder II: Speech of Clouds (2003). Wolfgang RIHM: Klavierstück Nr. 6 (1978); Klavierstück Nr. 7 (1980). Galina USTVOLSKAYA: Sonata No. 6 (1988). Luciano BERIO: Six Encores: Wasserklavier (1965) and Brin (1990). Morton FELDMAN: Nature Piece No. 4 (1951); Piano Piece 1964 (1964). Tristan MURAIL: Cloches d’adieu, et un sourire (1992). John ADAMS: China Gates (1977). Karlheinz STOCKHAUSEN: KLANG: Natürliche Dauern Nr. 5 (2005-06). Salvatore SCIARRINO: Polveri laterali (1997). Marino Formenti (pno). Kairos 0013292KAI (2 CDs) (http://www.kairos-music.com/). 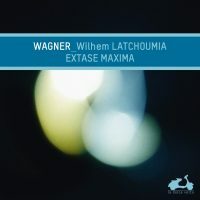 “Wagner: Extase Maxima.” Richard WAGNER: Fantasia in f-sharp minor, WWV 22 (1831); Isoldens Liebestod (1859; arr. LISZT, S. 447, 1868); Elegie, WWV 93 (1858?). Franz LISZT: Phantasiestück über Motive aus Rienzi, S. 439 (1859). Gérard PESSON: En haut du mât (une chanson de marin) (2009). Alfred JAËLL: Transcription from Drei Stücke aus Richard Wagner’s Tristan und Isolde, Op. 112 (1861). Hugo WOLF: Paraphrase über Die Walküre von Richard Wagner (ca. 1880). Wilhem Latchoumia (pno). La Dolce Volta LDV 16 (1 CD) (http://www.ladolcevolta.com/). Michiels gathers a comfortable group, finding relationships between the apparently dissimilar. Liszt and Beethoven largely suggest a conventional program of potboilers but not this unfamiliar menu. No pianist would consider Beethoven’s own arrangement of The Creatures of Prometheus ballet to be standard rep, as much of it is forgettable. Michiels breaks it into digestible sections across the first two of three discs, interspersed among Liszt and Wagner piano transcriptions of operas (Tristan und Isolde and Parsifal) and a tone poem (Von der Wiege bis zum Grabe). Wagner died in Venice in February 1883, and Liszt in Bayreuth in July 1886. If simplicity is supreme, then it can be argued that Liszt upstaged his son-in-law’s harmonic daring in those last years. Liszt wrote several pieces observing Wagner’s passing and some explicitly refer to Venice, among them Am Grabe Richard Wagners, which Michiels offers with clarity hard to match in ensemble renditions, for example the Berliner Solisten who add harmonium to string quartet and ad lib harp (Teldec 2292-46277-2). Nono fits well into Michiels’ scheme: He was born and died in Venice, and wrote an opera about Prometheus. Encouraged by the slipcase’s Venetian images, …sofferte onde serene… for piano and tape conjures water slapping against stone embankments and bells obscured by fog exceptionally well. Sofferte was written to mark losses in the families of its composer and the dedicatee, Maurizio Pollini. Powerful without being grandiose, Nono is a wonderful antidote to Wagner. Holliger’s 30-minute Partita is at the center of disc three. Its Praeludium and Fuga are echoed by the surrounding Bach, there is a “Petit Csárdás obstiné” to mirror Liszt’s Two Csárdás, the Barcarola is appropriate to Venice, and the two Sphynxen für Sch. with their interior sounds recall Nono. “Sch.” refers to Robert Schumann, one of several mentally ill artists whom Holliger has explored in his own work. Worth noting are the key choices of the Bach (Sinfonias in F and B minor, then Preludes and Fugues in B and F major) which reflect tritones in the Holliger and in Wagner’s Tristan. Michiels uses an 1875 Steinway for everything but the Nono and Holliger; those are on a 2007 instrument. The older piano adds a delightful haze, and when explored at the extreme of its dynamic range, seems louder and vigorous. The modern instrument is immense by comparison and Holliger’s chords outline steep chasms. Formenti’s Liszt Inspections is hard to grasp as a linear program. Perhaps Formenti is suggesting that Liszt invented the future, the predecessor of both Satie’s purposelessness and Schoenberg’s dissonance. Indeed, Liszt’s later, aphoristic compositions strayed from Romantic tonality and forms, and if some of his music touches upon death or religious devotion, pieces may also not conclude neatly, a hallmark of the modern. This program challenges because the contemporary items don’t easily stand alone as miniatures or as distinctive contrasts to the surrounding Liszt pieces. Most everything is unsentimental: Rihm and Ustvolskaya are powerful jolts; Berio and Pesson are subtle encores; I never seem to catch the start of the Feldman pieces. 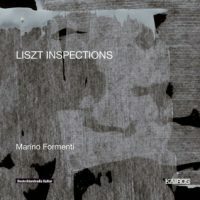 Formenti appears to have chosen modern works that don’t actually tell us much about Liszt. Even though it’s short and worth a listen, I don’t understand why the Adams is here, despite sonic similarities to Liszt’s immediately preceding Abendglocken from Weihnachtsbaum. Lots of composers have been inspired by bells; why specifically is this bit of Minimalism included? If you remove all the Liszt, the program baffles immensely, lacking both center and obvious unity. Possibly Formenti is instructing us on subtle technical aspects, as if to say that certain Liszt figurations or technique foreshadowed contemporary motives or gestures. Even the Ligeti Études land as mild changes of scene: Perhaps we should hear them as two Hungarian expats communicating across the ages. Recalling Formenti’s Kurtág set, it astonishes that he would curate a collection that puzzles even more. Disc two (59:01) does seem more introverted and wistful than disc one (71:12). It is hard to adopt favorites, and I was not sparked to seek other renditions to place into context. Of these three collections, Latchoumia’s program is most like a recital. Michiels’ is too long for an evening and Formenti’s haphazard glossary grows alienating. Latchoumia starts with Liszt’s rousing exploration of Rienzi themes, and then turns to one of Wagner’s own piano items. The early Fantasy (written somewhere around the age of 18) suggests Schubert’s melodies rather than Beethoven’s industry. Arcing lines are supported with sturdy accompaniment indicating that even at this early age Wagner was envisioning orchestral recitatives. The piano figurations are nowhere near as elaborate as Liszt’s, although I hear Latchoumia connecting this Fantasy with Liszt’s Sonata. Operas were Wagner’s instrument of choice; there are no substantial piano works after the first blooms of juvenilia. Mature Wagner on piano comes to us from others who fashioned paraphrases and transcriptions, fancifully ornamented and designed for drama and virtuosity. Jaëll’s Tristan study doesn’t emphasize the chromaticism, whereas Liszt’s Liebestod necessarily launches right into the thick of it. Wolf’s Die Walküre exploration at 22:52 is the largest item here, just slightly longer than the early Fantasy; in fact, it prompts all sorts of comparisons in structure and intentions. Not all Wagnerian ruminations are grand and callisthenic: Pesson’s miniature is sparked by the sailor’s lonely song which opens Tristan, adding harmony and fog.